Our sweet potatoes are well-loved thanks to their beautiful exterior skin and bright interior flesh. These non-GMO, sweet potatoes offer a sweet mellow flavor with a soft, moist texture once cooked. Baywater Farms sweet potatoes are nutritionally complex and full of vitamins, antioxidants, and beta carotene. Baywater Farms grows delicious, non-GMO, sweet potatoes and offers them in bulk packs. All of our sweet potatoes are carefully harvested when ripe, and they will continue to ripen and sweeten with time. Sweet potatoes are versatile and can be used to add a touch of sweetness to savory dishes or to serve as the basis for a dessert. You can steam, bake, or roast whole sweet potatoes or make sweet potato fries by cutting them into wedges. The inner flesh of Baywater sweet potatoes can be made into a puree for bread, sauces, cakes, or sweet potato pie. Our sweet potatoes are so versatile that they won’t just see your table on Thanksgiving. Sweet potatoes are harvested when they are ready and ripen further once they have been picked. When first taken out of the soil, our sweet potatoes are typically not too sweet yet. Once they have time to sit, for 7-10 days at room temperature, the inner flesh will sweeten and continue to become more nutritious. While young sweet potatoes can be used for casseroles or baked goods that have additional sweetener added, wait to bake, roast, or puree sweet potatoes until they have had plenty of time to sit. Ripe sweet potatoes can last for long periods of time when stored in a cool and dry place. Never store whole, raw sweet potatoes in the refrigerator or they will harden and lose their delicious sweet flavor. 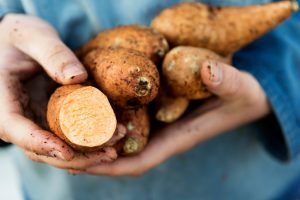 You can find our fresh, non-GMO sweet potatoes in national grocery store chains, produce distribution companies, roadside farm stands, local farm-to-table restaurants, CSAs, and farmers’ markets. To learn more about ordering our fresh local produce, click here. Our excellent sustainably grown, non-GMO produce speaks for itself, and we know your taste buds will love to listen!